Critical ways to support adult children in their parenting. We make all sorts of assumptions when we first become grandparents: we raised successful children, our adult kids will welcome our parenting advice; we will be able to see the grandkids whenever we like; we will buy a jogging pram and run with our new granddaughter along the canal; we will turn the den into a bedroom for the grandchildren. Somehow, it seldom occurs to us to check out the underlying assumptions we are making: that our parenting advice is still relevant today; that our need to see the grandchildren will take priority; that the new parents will be relaxed and comfortable having their one year old pushed in a pram by a jogging grandpa or having a sleepover at grandma’s. 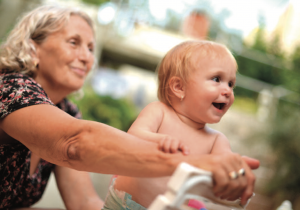 Understanding our adult children’s expectations of us as grandparents is key to developing and maintaining a good relationship. This takes time and good communication skills. Hard as it is to see all of our hard-won parenting wisdom going to waste, good communication means more active listening and less talking. Active listening includes consciously paying attention (not multi-tasking), asking relevant questions to ensure understanding, and not interrupting. Guilty as charged. Interrupting sends a variety of negative messages: What I have to say is more interesting and important; I know what you are going to say; I don’t care what you think; I don’t have time for your opinion. Active listening also means listening without immediately jumping to conclusions. As soon as we indulge in judgmental bemusements, we have compromised our effectiveness as a listener. Thinking “I knew baby Harry shouldn’t have been picked up every time he cried,” may prevent us from asking and understanding why they pick him up. Perhaps like two of my sons, Harry has colic and letting him cry himself to sleep only exacerbates his discomfort. Studies confirm that most of us are poor and inefficient listeners. The benefits of improving this skill, are worth the effort. Good listening will build trust with our adult children and their partners. They will be more likely to share what is happening in the family, their concerns and issues. Really listening will broaden our understanding of their hopes, fears and expectations as parents, and will help prevent misunderstandings and hurt feelings. My young friend Julie still talks about how, as a new breastfeeding mother, every time she complained about being exhausted, her mother would interrupt with long stories about herself as the mother of twins. Being one of the twins, Julie knew it must have been challenging, but all she wanted was a little empathy. Besides, Julie was twelve years older than her mom was when she had her twins, and she was going back to a very demanding job. As a result, Julie stopped having any real conversations with her mom, wanting to avoid the “I had it worse” conversation. Offer concrete support such as babysitting: Many new parents don’t trust anyone but family to mind their children, especially for the first six months. They said they don’t worry because they assume their parents can handle a crying baby. They realized they needed time together as husband and wife but felt they simply couldn’t have this time together unless their parents were available to babysit. Some actually had pretty high expectations of the grandparents — which would obviously have to be negotiated! As I was writing this column, I was thinking about my sweet mother who passed away last year at age 92. Always interested in what we had to say, always encouraging, never interrupting, never giving unsolicited advice, Mom was the one we all turned to in times of joy or sorrow. This mother of seven, grandmother of fifteen and great grandmother of twenty-three, truly had listening down to a fine art. Mary Jane Sterne and Peggy Edwards are best friends and the authors of Intentional Grandparenting: A Boomer’s Guide, (McClelland and Stewart, 2005). Available from your favourite bookstore or online at Chapters.Indigo.ca. The authors live in Ottawa and have 23 grandchildren and five great grandchildren between them.